All prices include: flights, transfers, accommodation, guided activities, cold weather clothing and guides; all as listed. 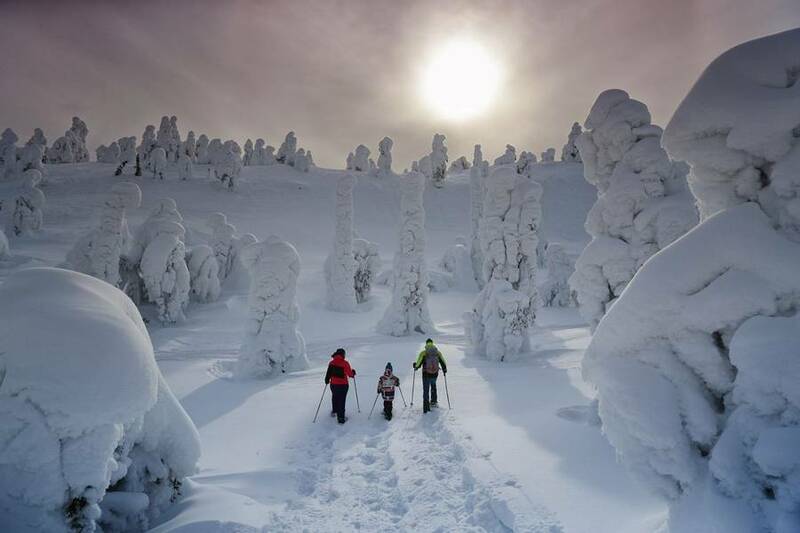 We are so excited to offer Ruka’s fantastic facilities and list of activities. The great thing about this destination is that the activities are very diverse, so there is something for every family member to get involved in. The starting points for all of the activities are on site, making it easy to get around, and really adding to the atmosphere of the place. 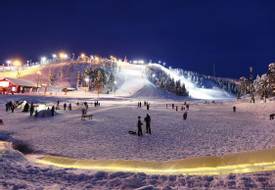 Ruka is located in the north of Kuusamo, a Finnish municipality that is renowned for its natural beauty and almost untouched wilderness. 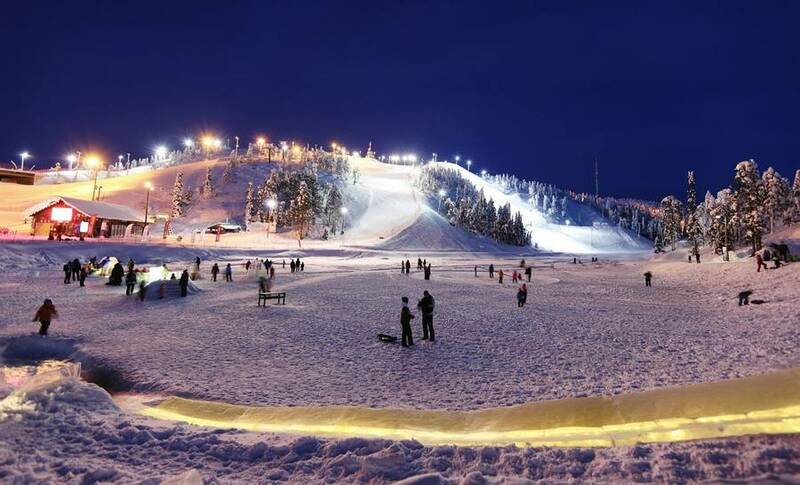 Ruka, one of the largest ski resorts in Finland, is among the country’s major holiday destinations, due to its excellent snow sports opportunities. This is a place that lies in the heart of excitement and adventure. 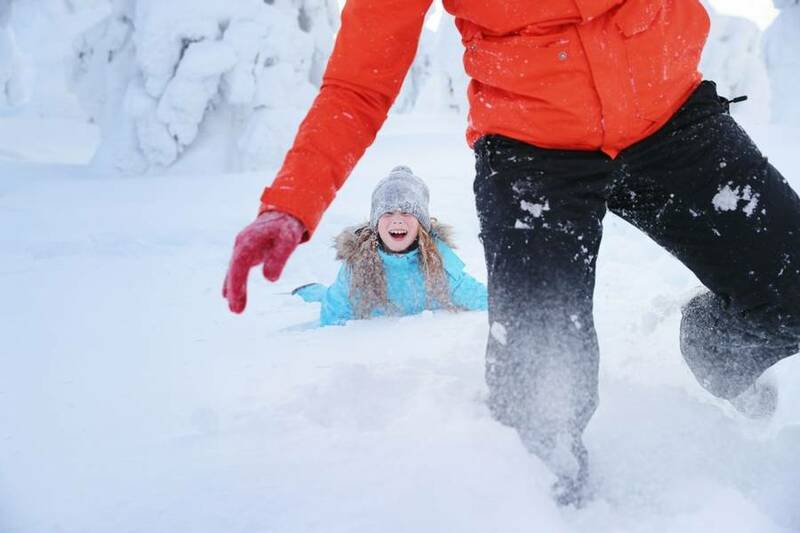 Ruka offers a number of activities for the family to enjoy, and you have complete control over your holiday as you can choose exactly what you would like your week to consist of. 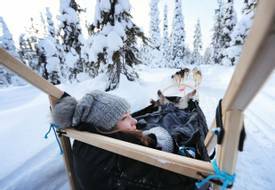 You can snowmobile or husky sled over the snowy fells, or relax in the saunas and Jacuzzis in Iisakki Village during an authentic sauna experience. Why not treat yourselves to a unique overnight stay in a cosy igloo that sits amongst the snow in Iisakki Village? There is something to suit every member of the family due to the diverse range of options available. You will be met at the airport and transferred to your accommodation in Ruka, where you can settle into your cosy apartment and explore the shops and restaurants at the Ruka Centre. You will have a welcome meeting, where you will be given all of the information you need for your trip and you can ask any questions that you might have. The great thing about our tailor-made option is that you can choose exactly what you want your trip to involve. The base price includes your flights, transfers, accommodation for seven nights, cold-weather clothing for the duration of your stay and fully qualified wilderness guides and instructors during your chosen activities. You select the activities you would like to do from the list shown in the 'Activities' section, ensuring your holiday can be as active or gentle as you wish. Fill these days with as many or as few activities as you wish, selecting from the options listed in our 'Activities' section. There are many activities to choose from and should you need advice on the best options for you, please speak to one of our Travel Experts. They will be happy to help prepare the perfect itinerary for you. You will be transferred to the airport ready for your flights home or you may wish to extend your stay. Ask our Travel Experts about extension options. Within walking distance to Ruka Centre and only 1km from Ruka’s downhill slopes, Vanha Karhu Apartments offer the ideal base for a winter trip. Well known for its wellbeing facilities there are several saunas and outdoor hot tubs available for guests and your apartment even offers its own private sauna. The newly renovated, modern yet cosy décor of the interiors, provides a warm atmosphere which is perfect for relaxing after a busy day in the snow. Your beautifully decorated, spacious apartment has its own living area (with a TV), fully equipped kitchenette, shower and toilet, private sauna and a separate bedroom. Each cabin also has its own terrace/porch. Wi-Fi is available and hairdryers are provided. Around 10 minutes from Ruka Centre lies Iisakki Village, where a selection of snow igloos provide a truly memorable night of accommodation. Guests are transferred to this remote spot at around 7pm, and on arrival will enjoy a set three-course meal in the restaurant. Following dinner, you can check into your igloo. 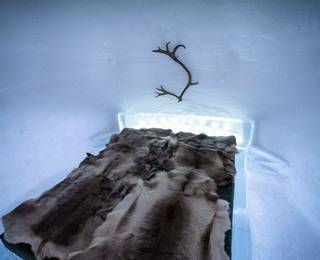 You will sleep on a bed made of ice which is covered with a mattress and cosy reindeer skins. The inside temperature is a constant -5C and you will be provided with a military grade sleeping bag to keep you warm during the night. There is a heated area for guests to use situated a short walk from the igloos and this contains the toilet facilities. The next morning you will enjoy breakfast at the Iisakki before being transferred back to your accommodation in Ruka. This basic snowmobile safari introduces first-timers to the thrill of snowmobiling. Before you begin, your guide will give you a thorough safety briefing and introduction before you take to the snow. You will cover around 20km, with two people per snowmobile, driving through the stunning snowy forest scenery (driver must hold a full driving licence). Children below 140 cm will travel in a sled pulled by the guide. During the drive, you will stop for a break of coffee or tea and a sweet bun. Guide, instruction and equipment included. This is a truly magical and essential activity for a Christmas family holiday. Nothing is more exciting to children at Christmas time than the thought of Santa Claus! You will take a 30-minute transfer to Mr and Mrs Claus’s secret cottage, where you will spend time with Santa, bake cookies in the cottage and play with Santa’s helpers in some outdoor activities. Relax and unwind at Iisakki’s lakeside sauna. A local guide will talk you through the origins of sauna culture and why it is so important to Finns before you take to the sauna yourself. You will have a real, authentic experience, spending two whole hours warming up in the sauna, dipping into the ice pool, lazing in the Jacuzzi and repeating the cycle! You will be served berry juice, water and tea as well as small snacks. Afterwards, the evening will begin with a short film about the Northern Lights in a rustic outdoor barn theatre. Then, you will all move to Iisakin Talo for a buffet dinner, consisting of wild food delicacies such as fish, wild game and berries. The Wild Food Dinner is not suitable for vegetarians or vegans. 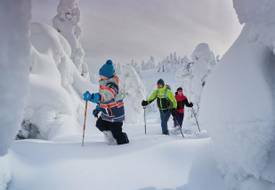 This tranquil snowshoe hike will take you to the most beautiful part of Kuusamo as you arrive at the Oulanka National Park under its winter blanket. You’ll hike beside river Kitkajoki to see the Myllykoski old mill amongst the incredible winter scenery. You will hike a total of around 4km and during the programme, you will enjoy a coffee and sandwich break. Ice fishing, or as the Finnish say, ‘pilkki’, is a traditional hobby of the locals. After drilling a hole into the beautiful frozen lake, you will set up your pilkki to lure in the fish beneath the ice. You might catch perch, whitefish, roach, pike, or even grayling, and if you are lucky to catch something, a guide will show you how to prepare the fish over an open fire. The experience includes a short snowshoe walk of around 1km in order to reach the ideal fishing spot and a coffee break on the lake. This truly fun and thrilling activity will crank up the energy levels for the day and fill your family will excitement. 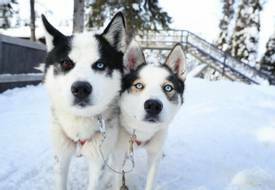 First, you will take a ten-minute transfer to meet your husky team, getting to know the life of the huskies at the husky farm, with time to cuddle and play with them! 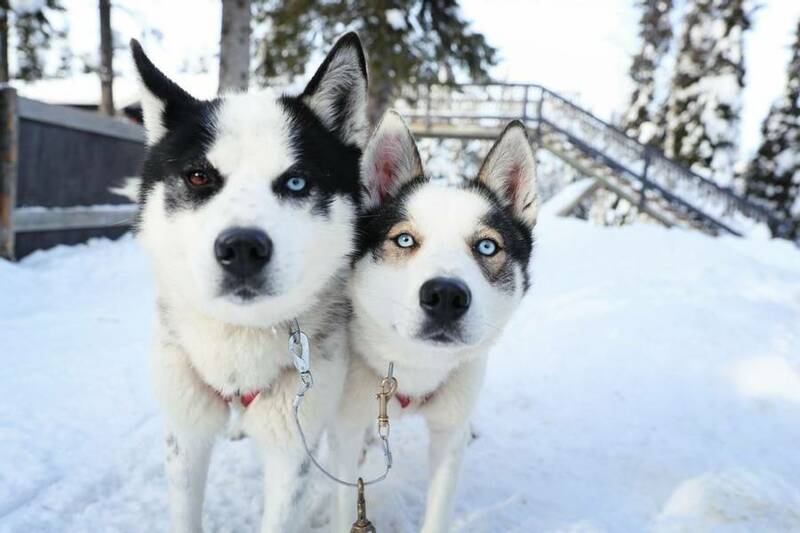 After learning how to drive the huskies, you will share an exhilarating ride with your family as your energetic and enthusiastic huskies take you, two people per sled, on a 5, 10 or 20 km ride. The programme also includes coffee and hot sausages by the fire. 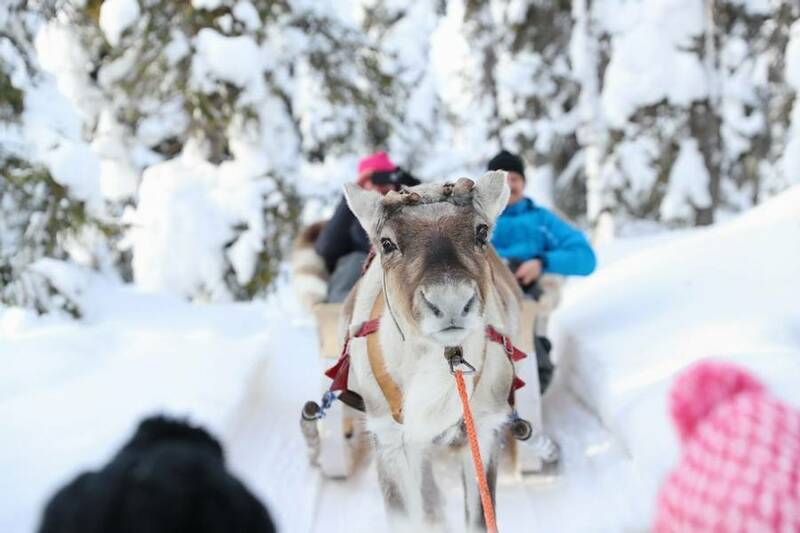 You will be picked up from the Safari Centre by a car transfer and taken to an idyllic reindeer farm. 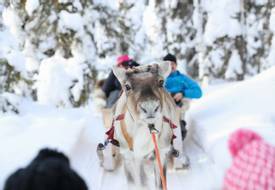 This is a great family activity, as the reindeer pull two people per sled through the snow for around 300m OR 1.5km, depending on which length you book. You even have the chance to feed the reindeer and listen to stories of their life and history. When you return with your reindeer, you will receive a certificate and be served a hot drink, reindeer sausages and a sweet snack. Please note: the longer sleigh ride will incur an additional charge, please speak to our Travel Experts for further details. This is an unforgettable adventure for families, as you drive away into the forest with up to six people per sled. The route will take you through varied landscapes so you can really absorb the scenery. 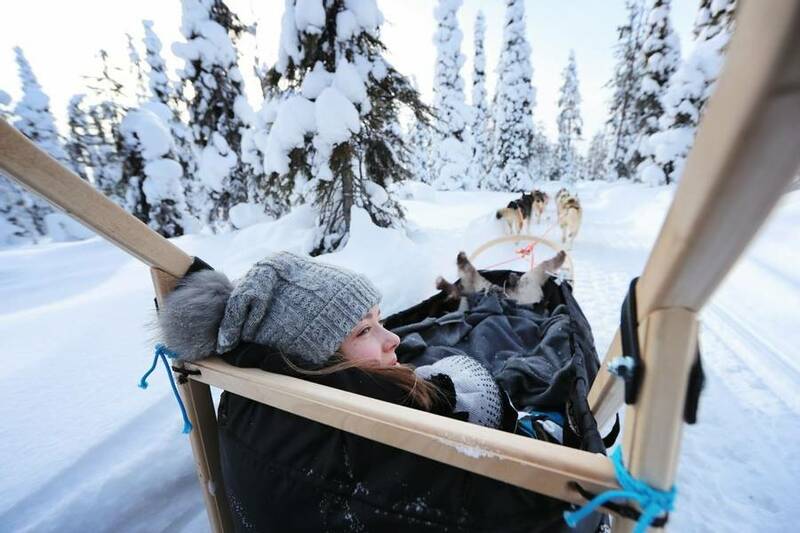 After around one and a half hours of sledging, you will arrive at the camp, where you will make a fire with your guide and prepare coffee, tea and grilled sausages. 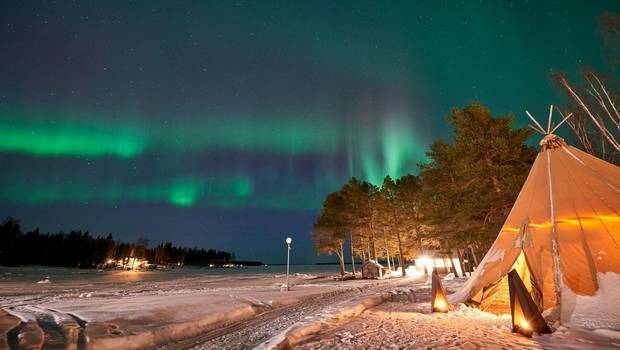 If you are lucky you may catch sight of the Northern Lights in the sky while you travel. 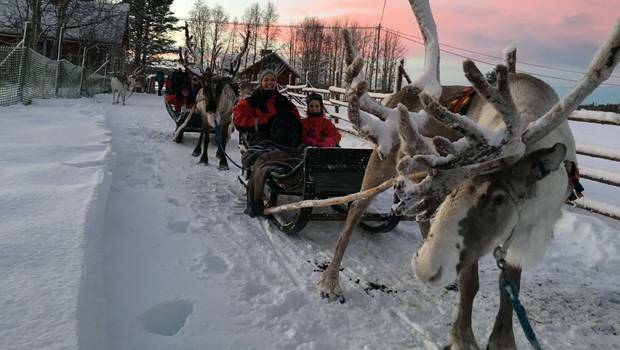 During this peaceful activity, you will follow an old reindeer trek route of around 4km in the beautiful fell surroundings. Every now and then the group will stop to admire the nature and snow-covered scenery. If the sky is clear you will see the myriad of bright stars in the sky and, with a little luck, the colourful Northern Lights. You will also break for a hot drink along the way, and your guide will tell you stories about the Northern Lights and nature. This promises to be a memorable evening as your snowmobile safari will take you through an enchanting blue twilight forest. With two people per snowmobile (driver must hold a full driving licence), covering around 30km, the darkness will provide additional excitement to your snowmobiling experience and if the sky is clear and you are lucky enough, you might even see Northern Lights. During the safari, you will stop to enjoy coffee, bun and sausages by the fire. On this snowmobile safari, you will venture one person per snowmobile west to east, to the top of the magnificent Kuntivaara Hill, which is 480m above sea level. The Russian border is just around the corner and the breath-taking scenery over the Arctic wilderness is a sight that you will cherish forever. The journey is around 100km in total and is well worth the challenge. During the safari, you will enjoy a soup lunch and coffee in a cosy wilderness restaurant. In this programme, you can test your driving skills through an enchanting snowy forest. Each RZR car holds two people, so you can share the fun as you take to the tracks. There will also be a small contest between your group with the fastest driver winning a special prize! Drivers must hold a valid licence. Guide, instruction and equipment included, including helmets and seat belts. This snowmobile safari will have you driving through beautiful forests and ice-covered lakes to an idyllic and private reindeer farm. Your trip will also consist of a short reindeer sleigh ride, the chance to feed the reindeer and learn about their lives in Finland. When you return with your reindeer you will receive a certificate and enjoy a hot drink, sausages and a sweet snack. The driver must be 18 years or older and hold a valid driving licence. 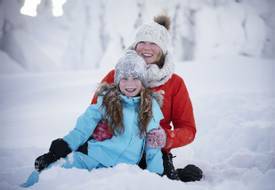 Overall, you will cover around 50km on your snowmobiles, with two people on each snowmobile and children below 140 cm travelling on a sled pulled by your guide. You will be picked up from the Safari Centre and taken on a short, ten-minute transfer to Iisakki Village, where you can admire the old buildings and snow sculptures that the village offers. Prior to dinner, you will be shown a short film about the spectacular Northern Lights in a rustic barn. Your traditional three-course dinner will be served in Iisakin Talo, Iisakki Village’s old main house, where you will have the opportunity to taste local, wild food delicacies such as fish or wild game – there is something for all of the family to enjoy. This experience is not suitable for vegans or vegetarians. If you are here for Christmas Eve, you can celebrate with a delicious dinner in forest restaurant Kontioluola. You can choose from their appetising menu and enjoy your food by the open fire on your candle lit table, as you look forward to Christmas Day. The transfers are included in the price, so you will be taken to Kontioluola and brought back to your accommodation. Cancellation terms: Please note that the following cancellation terms supersede those mentioned in section 7 of our general booking terms and conditions.